Ahmet Altan is a prominent novelist, journalist, and was the editor-in-chief of Taraf, a liberal daily newspaper, from 2007 -2012. His brother Mehmet has been a Professor of Economics at Istanbul University since 1986 alongside his work as a journalist and a human rights defender. 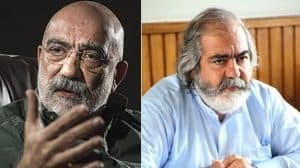 Altan and Mehmet Altan were arrested on September 10, 2016 in a dawn raid for allegedly giving subliminal messages the night before the failed coup on July 15, 2016. They were charged with attempting to overthrow the “constitutional order,” “interfering with the work of the national assembly,” and “interfering with the work of the government” through violence or force. On April 17, 2017, the prosecution officially indicted the Altan Brothers, as well as fellow journalist Nazlı Ilıcak. On February 16, 2018, the 26th High Criminal Court in Istanbul convicted Ahmet and Mehmet Altan and Nazlı Ilıcak of attempting to overthrow the constitutional order through the use of force and violence. Ahmet, Mehmet, and Nazli—along with three other journalists—were sentenced to life in prison. On October 2, 2018 the conviction was upheld by the 2nd Penal Chamber of Istanbul Regional Court of Justice. The appeal procedure of the case is currently on-going at the Supreme Court of Appeals. Ahmet Altan has served as the founding former editor-in-chief of Taraf, a liberal daily newspaper, from 2007 -2012. His brother Mehmet has been a Professor of Economics at Istanbul University since 1986. He is also a journalist, a prolific author, and a human rights defender. The brothers were arrested in a dawn raid, as part of a wave of arrests of thinkers and writers following the failed coup of July 15, 2016. Along with fellow journalist Nazli Ilıcak, their trial began on June 19, 2017. Their alleged crime consists of giving subliminal messages to rally coup supporters on a television panel show broadcast the night before the coup attempt. The current charges against the brothers stem from a television panel appearance discussing the long history of military involvement in Turkish politics. The Turkish government claims the comments made during the broadcasting were “subliminal messages suggestive of a coup attempt” and a signal to plotters to take action. This is not the first time Ahmet Altan was put on trial for his works. In July 2013, Ahmet Altan was found guilty of defamation for a January 19, 2012, editorial piece he published in Taraf: “Morality and Enabling the State.” He was initially sentenced to 11 months in prison, but the sentence was commuted to a 2,800 Euro fine. He has faced various other defamation charges in connection with his work, both his provocative journalism and sensual novels. As of September 2016, Ahmet Altan was still on trial in a separate case which began in March 2015, related to his previous work as editor-in-chief of Taraf. Along with two other editors and two journalists he is accused of acquiring, destroying, and divulging documents concerning the security of the state and its political interests. March 19, 2019: Imprisoned Ahmet Altan is convicted for insulting the president in an article named Yeni Ergenekon published by P24 in 2016 and is given an administrative fine of TL 7000. Altan’s lawyers say there will be an appeal process. March 13, 2019: Simon Callow publishes a review of Ahmet Altan’s latest book I Will Never See the World Again, celebrating his determination to create work about his arrest and captivity, and calls for an end to his unjust conviction. January 14, 2019: The State of Emergency Commission rejects the application of Mehmet Altan for his return to his position at Istanbul University. The reasons for rejection are indicated as “Altan’s ongoing trial” and “the administrative report regarding Altan.” According to Mehmet Altan and his lawyer, the commission thereby unlawfully disregarded the decision of the Constitutional Court, which ruled that the arrest of Altan and the evidence regarding him were against freedoms of press and expression, and a violation of his rights. Altan’s lawyer files a criminal complaint against the members of the Commission for failing to comply with the constitution as members of an administrative institution. January 8, 2019: The Office of the General Prosecutor of the Supreme Court of Appeal submits its opinion to the relevant chamber of the Supreme Court of Appeal, demanding that the lower court’s decision upholding life sentences for Nazlı Ilıcak, Ahmet Altan, and Mehmet Altan be remanded. The Office finds the charge for conviction inapplicable, and asks for a re-trial for the charge of “aiding a terrorist organization without being its member.” The latter charge is punishable by one to three years in prison, unlike the former conviction of life sentence. The opinion of the general prosecutor is not binding. The 16th Criminal Chamber of the Supreme Court of Appeal will decide on the appeal. Even if the chamber rejects the application of the defendants, the Office of the General Prosecutor can still object to the decision. January 4, 2019: Ahmet Altan’s lawyer launches a campaign to file a petition before the Constitutional Court until the Court decides on the journalist’s individual application, pending before the court since November 8, 2016, even though it was given priority status. Usually the Court decides on individual applications within 6 months but in Altan’s case, the court has not delivered its decision in 22 months. June 27, 2018: An appeals court in Istanbul orders Mehmet Altan’s immediate release. February 16, 2018: the 26th High Criminal Court in Istanbul convicts Ahmet and Mehmet Altan and Nazli Ilicak of attempting to overthrow the constitutional order through the use of force and violence. Ahmet and Mehmet Altan, along with Nazli Ilicak, are sentenced to life in prison. November 2017: Altan Brother’s lawyers are ousted from court by presiding judge. As a result of the dismissal of their counsel, the brothers are forced to defend themselves via a video link from Silivri prison. There request to be released from detention was denied. Court schedules a fourth hearing for the 11th of December. As the Turkish government prolongs detention of journalists, The European Court of Human Rights (ECHR) sets a deadline for the government to provide a defense for the detention. In the brief filed on behalf of the journalists, they state their detention is “politically motivated judicial harassment” which “breaches their freedom of expression.” The Turkish government is required to submit all materials for the defense by the 5th of December. June 23, 2017: In the fifth hearing, the 26th penal Turkish Court rejected a demand to release the brothers on the basis of a “strong crime suspicion,” the “possibility of lacking judicial control,” and “suspicion that the suspects may flee.” The brothers face three aggravated life sentences if found guilty. June 19, 2017: The trial of the Altan brothers begins. 17 defendants have been grouped together in this trial, 11 of whom have fled the country. The other six, including the Altans and Ilicak, remain in detention while the trial is ongoing. April 17, 2017: Ahmet and Mehmet are both indicted, along with fellow journalist Nazli Ilicak. September 21, 2016: the court releases Ahmet Altan on probation. He is re-arrested on September 23. Both brothers have since remained in detention. September 10, 2016: Ahmet and Mehmet Altan are arrested in a dawn raid as part of a wave of arrests of thinkers and writers following the failed coup of July 15, 2016. They are suspected by the government of President Recep Tayyip Erdogan of providing “subliminal messages suggesting a military coup.” The brothers remain in pretrial detention. March 2015: Ahmet Altan and four other journalists and editors stand accused of acquiring, destroying, and divulging documents concerning the security of the state and its political interests. July 18, 2013: Ahmet Altan was found guilty of defamation for a January 19, 2012 editorial piece he published in Taraf, titled “Morality and Enabling the State.” He was initially sentenced to 11 months in prison, but the sentence was commuted to a €2,800 fine. He has faced various other defamation charges in connection with his journalism and fiction writing. Following the coup attempt on July 15, 2016, freedom of expression has rapidly deteriorated in Turkey. Over 180 news outlets have been shut down under laws passed by presidential decree following the imposition of a state of emergency. There are now at least 148 writers, journalists, and media workers in prison, making Turkey the biggest jailer of journalists in the world, surpassing China and Eritrea combined. Over 165 media outlets and publishing houses have been closed down since July 2016. Over 165 journalists and media workers have been jailed pending trial. Never in the near- 100 year history of PEN have we recorded so many writers in prison in one country at one time. Over 145,000 civil servants have been summarily dismissed and more than 47,000 people have been jailed pending trial. Turkey’s Kurdish population has been disproportionately affected, with arrests of Kurdish journalists and MPs, closures of pro-Kurdish media outlets, and the forced replacement of elected local officials.